Materials Needed: Plaster wrap, swim cap, petroleum jelly, plaster of pairs, Oil based modeling clay, clay shaping tools, Liquid Latex, Paint, Paint Brushes, Baby Powder, Exacto Knife, Bald Cap. Step 1: Make a mold of your head using plaster wrap that you can purchase at any craft store. Make sure you cover your hair with a swim cap and your face in petroleum jelly. Step 2: Fill mold of your head with Plaster of Paris also available at any craft store. 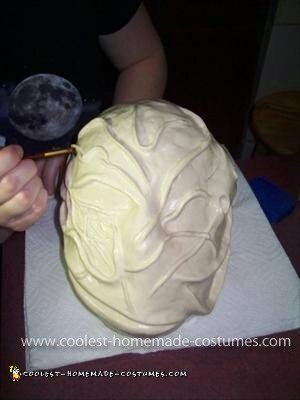 This will give you the base to sculpt you design on and will make your mask a custom fit to your head. 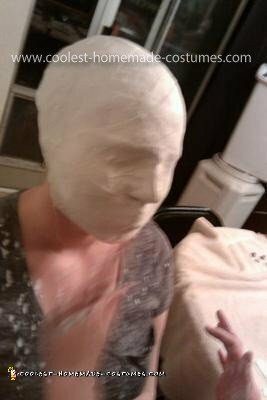 Step 3: Using oil based modeling clay on top of the plaster of paris mold of your head, sculpt the design of your mask any way you like. *IMPORTANT* make sure you get OIL BASED modeling clay because it can be left out and never dry out. Any other type of clay you get WILL dry out, harden, and crack. I used Van Ake Plastalina clay in Ivory, also available at most craft stores. Step 4: Once you’re done sculpting your design and are happy with the way it looks you’ll need to coat the entire mask in a thin layer of petroleum jelly. Make sure you get into every little nook and cranny!! Step 5: With a clean, never used paint brush, brush on a thin layer of liquid latex, again making sure to get into every nook and cranny. You will paint on one layer at a time, waiting till the layer you just painted is COMPLETELY dry before applying the next layer. You will do this till you have about 20 layers (this will take you several days). I used Mask Making Latex (also known as Slip Latex) from www.fxsupply.com, I bought the 1 quart size and made 2 masks, and had SO much latex left over, so you can definitely get away with a smaller amount of liquid latex. *IMPORTANT* make sure you wash your paint brush out after each layer otherwise it will dry up in your brush and you won’t be able to use it again. Step 6: Once you have all your layers on and it is completely dry, you can paint your mask!! I used tan/flesh, grey, black, and white colors. You will need to mix your paint with equal amounts of liquid latex or your paint will not stick to the mask and will crack when you try to put your mask on. Put your paint/latex mixture in a container with a lid so it doesn’t dry out. Step 7: Once your mask is painted and dry, you can peel it off the mold. The inside of your mask will have a layer of petroleum jelly in it so you will need to wipe as much of it out as you can, then sprinkle some baby powder inside to dry out the rest. With an exacto knife cut out your eye, nose, and ear holes so you can see, breath, and hear. I suggest putting your mask on first to see how it’s going to sit on your face/head then judge where to cut your holes (DO NOT try to cut the holes while the mask is on). Also at this time you can cut off any rough edges or bits that are hanging over, you know, just smooth out the edges. Step 8: Take a Bald Cap that you can get at any Halloween store and use the left over paint to paint it the same color as your mask. The nurses in the movie had no hair, so you’ll put the Bald Cap on first to cover your hair, then your awesome mask over that!! And that’s it!! As for the “dress” I took a lab coat and tea dyed it to give it a brown/burnt look. I then cut the sleeves, and took in the sides to make it more form fitting. With the left over material from the sleeves I made the nurse hat and attached it to the mask with Velcro. Would like to see the Pyramid Head too!